Lincoln Perry used live models for nearly all of the dozens of figures that move throughout “Students’ Progress,” his recently completed mural that wraps around the entire lobby of Old Cabell Hall. “Having a model sit can give an extra level of specificity and surprise, an energy sometimes lost when working from one's head or from drawings. I never work from photographs if I can help it,” Perry says. Perry has been a visiting artist at the University since 1985, and many of his paintings of Grounds are in the Fralin Art Museum’s permanent collection. In 1996, the Old Cabell Hall restoration committee asked Perry to add some movement and color to the building's newly restored but empty walls. After 16 years and two phases of work, Perry completed the mural in November 2012. Its 29 panels follow a fictional student, Shannon, along her undergraduate journey at UVA and into her adult life. Perry needed subjects to paint the many professors and fellow students Shannon encounters at the University. He did preliminary sketches of students and faculty on Grounds and created the panels in his studio in Maine. In 2000, Perry installed the first phase of panels on the lobby walls. “Once I was actually painting in Old Cabell, it was much easier to work from life,” Perry says. He asked faculty members to come to the lobby to pose for him. He placed ads for student dancers and actors, sometimes asking students who were walking through the lobby to model for him, too. Perry finished the graduation panel of what he then called “The Student's Progress” in 2000, but says that he was “drawn to the idea” that the story would continue. In 2006, Perry asked if he could continue painting Shannon’s journey along Cabell's walls, and former UVA president John T. Casteen III agreed. For the expansion, Perry first made a scale model of the lobby space, planning each new scene. He then painted on canvas he had mounted on the walls of Old Cabell, once again using live models for the figures. In the new panels, Shannon attends graduate school, marries, has a daughter, and teaches her to play violin. Shannon’s daughter then enters the University, following in her mother’s footsteps. Perry sees “Students’ Progress” as a return to Jefferson's original vision for the architecture of the University, where the Academical Village opens up into the landscape, symbolizing a student's wide-open future. When Old Cabell was built at the south end of the Lawn in 1898, it closed off that view of the mountains and made the University a more insular space. The completed mural, with Shannon's story leading into her daughter's, figuratively reopens that view. The Lawn, and the student’s future, once again connects with the world outside the Academical Village. The artist himself is a part of the University's landscape. Although the mural is complete, Perry’s likeness remains permanently at work in an east-side panel, facing south toward the mountains. 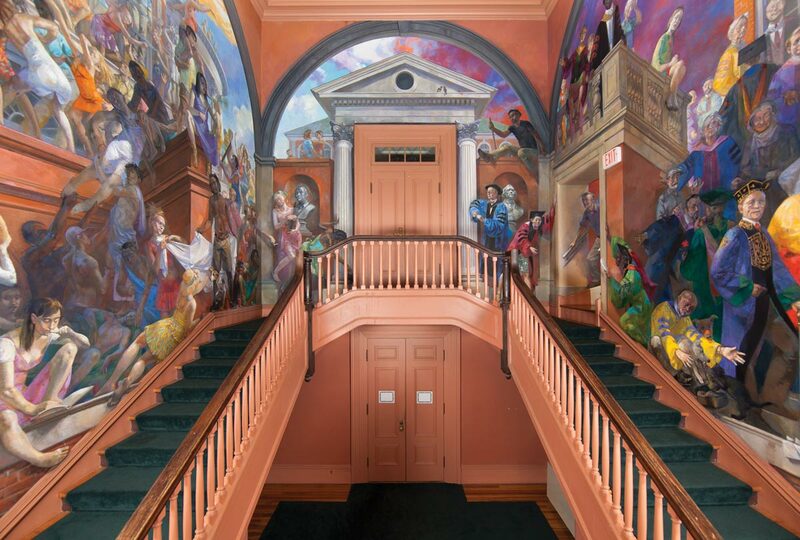 Perry calls this scene in the east stairwell the “innocence and experience” scene, with students on one side of the staircase (left) and professors on the other (right). Perry frequently incorporates elements of Old Cabell Hall’s actual architecture, such as this molding, into the composition of the image. Another example of how Perry integrated architectural elements such as doorways into the mural. These panels, directly across from the lobby entrance, depict Shannon’s undergraduate years. Shannon, a newly minted graduate, holds a silver balloon that reflects a spring landscape, a symbol of her wide-open future. Originally, this was the mural’s final panel, completed in 2000. Perry began the second phase of the mural in 2006, continuing the storyline he had completed six years earlier. In these panels, Shannon continues to study music after graduation, marries and has a child. In this north wall panel, Shannon, dressed as a witch, and her young daughter trick-or-treat during Halloween on the Lawn. In this panel on the lobby’s north wall, Shannon looks out over the Lawn, reflecting on her time at the University. Her daughter, dressed in yellow rain gear, peeks out from behind her. 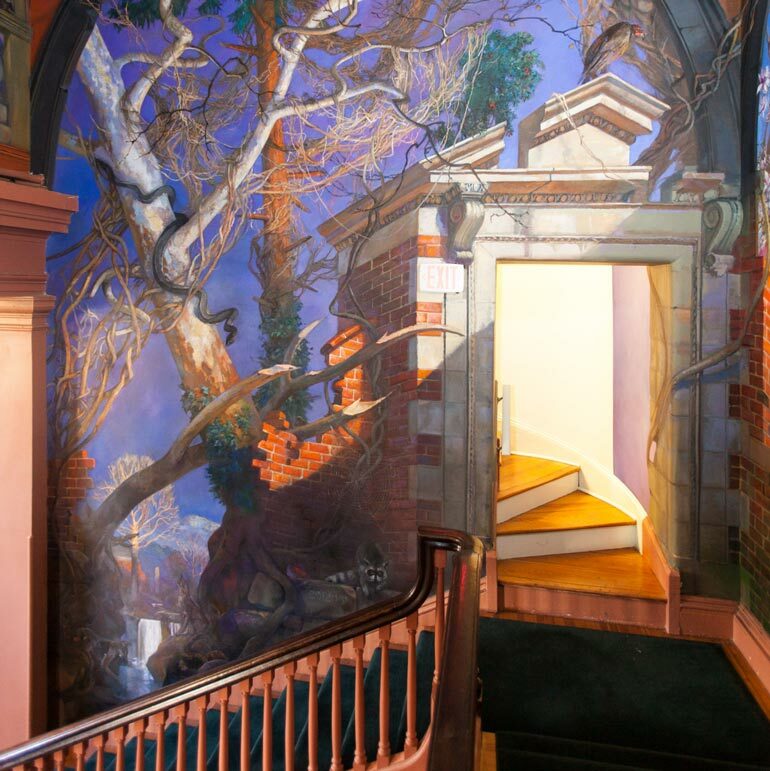 A scene in the west stairwell shows the change of seasons and the passage of time. These are the only panels without human figures and are instead inhabited by raccoons, squirrels, deer and birds. Detail shots of the west stairwell. In order to reach the higher points of the lobby walls, Perry had to erect scaffolding and paint while standing atop it, sometimes asking his models to climb up and join him.